We’ve spent the last week in New Orleans. It’s been fun visiting family, eating at some of our favorite haunts, and just enjoying the city’s amazing vibe. One of the things that has become more and more apparent in the years since Katrina is the rapid rise of bicycling in the city. It began with sharrows on some of the fairly major roadways across the city. Over time, we began to see bike lanes, then bike taxis in the French Quarter, dedicated bike lanes on some of the major roads into and out from the central business district, and bike shops springing up all over town. On this trip, we couldn’t help but see the throngs of tourists on bicycle tours of the city. The city seems to have made a commitment to alternative transportation. And many people have made the same commitment. Public transit has been big in NO at least as long as I’ve been alive. So I guess the willingness to NOT use a car was already there. I have not yet ventured out in NO on a bike (at least, not since my college days, when my bike and public transportation were my means of getting around). I’d like to do it, but I think I’d have to come down here with that as my primary agenda item, instead of visiting family and friends. Much of the family lives outside of town, and there is, literally, no way to go from New Orleans to points east by bicycle. The city’s latest project is the “Lafitte Greenway.” Work finishes up this spring on repurposing an old railway bed that runs for 2.6 miles from the edge of the French Quarter out to the Lakefront, pretty much bisecting the city. It will connect many diverse neighborhoods with a multi-use park, with sports facilities, paths, bike lanes, and businesses all along the perimeter. An ambitious, and inspiring, project. 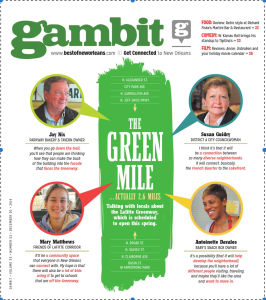 The Dec. 30 issue of “Gambit” gives some of the details. It is amazing to see. There are already bicycles everywhere. The city and businesses have installed racks all over town. There are people RIDING their bicycles everywhere you look. You’ll have to visit, rent a bike, and explore. And later this year, maybe even ride the Greenway! So many things to do, so little time! And besides, if you ride your bike there, you can afford to consume a few more calories in some of the most amazing restaurants you’ve ever seen.